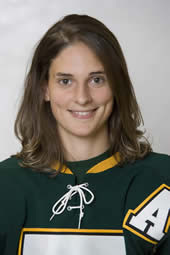 With a little help from St. Thomas Tommies standout defenceman Lucrece Nussbaum, the Swiss Olympic hockey team captured 5th place at the Vancouver 2010 Winter Olympics, with a 2-1 shoot out victory over Russia. Lukey had the first assist on Switzerland's only goal, registered 3 SOG, and played just under 29 minutes of ice time. CONGRATULATIONS ON A VERY SUCCESSFUL OLYMPIC GAMES!!! With 1 goal, 2 assists, and a bucket full of minutes played against some of the world's best hockey players, Lukey led her team's defence with 3 points during the games. She should be returning to Fredericton on Thursday!! WAY TO GO LUKIE!!! We are very proud of you!! A great accomplishment for a fine young lady. When I spoke to her before she left for the Olympics, she was very praiseworthy of the support she received from so many people in Fredericton and surrounding areas.